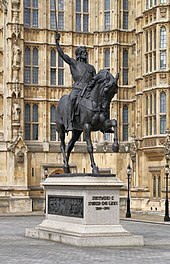 ^ "Richard the Lionheart Biography". www.medieval-life-and-times.info. Retrieved 2019-01-18. ^ a b Chisholm, Hugh, ed. (1911). 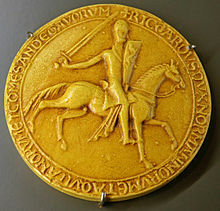 "Richard I." . Encyclopædia Britannica. 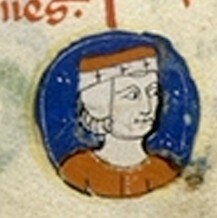 23 (11th ed.). Cambridge University Press. p. 295. ^ Ingle, Sean (2002-07-18). "Why do England have three lions on their shirts?". guardian.co.uk. Retrieved 29 April 2016. Maalouf, Amin (1984), "L'impossible rencontre", in J'ai lu, Les Croisades vues par les Arabes (in French) (XI, part V), p. 318, ISBN 978-2-290-11916-7 . 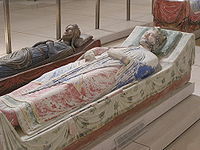 Berengaria of Navarre was Queen of England as the wife of Richard I of England. 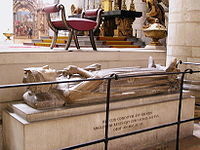 She was the eldest daughter of Sancho VI of Navarre and Sancha of Castile. 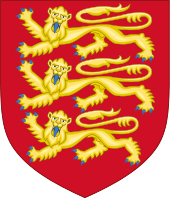 As is the case with many of the medieval English queens, relatively little is known of her life. 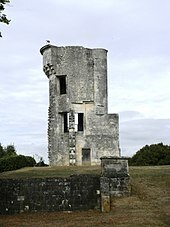 Château Gaillard is a ruined medieval castle, located 90 metres (300 ft) above the commune of Les Andelys overlooking the River Seine, in the Eure département of Normandy, France. It is located some 95 kilometres (59 mi) north-west of Paris and 40 kilometres (25 mi) from Rouen. 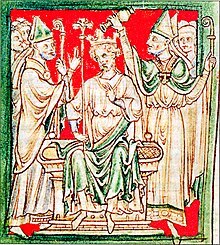 Construction began in 1196 under the auspices of Richard the Lionheart, who was simultaneously King of England and feudal Duke of Normandy. The castle was expensive to build, but the majority of the work was done in an unusually short period of time. It took just two years and, at the same time, the town of Petit Andely was constructed. Château Gaillard has a complex and advanced design, and uses early principles of concentric fortification; it was also one of the earliest European castles to use machicolations. The castle consists of three enclosures separated by dry moats, with a keep in the inner enclosure. 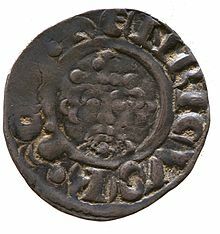 The Battle of Jaffa took place during the Crusades, as one of a series of campaigns between the army of Sultan Saladin and the Crusader forces led by King Richard I of England. 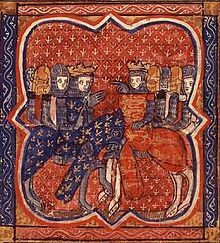 It was the final battle of the Third Crusade, after which Saladin and King Richard were able to negotiate a truce. Although the Crusaders did not regain possession of Jerusalem, Christian pilgrims were permitted entry into the city, and the Crusaders were able to retain control of a sizable strip of land stretching from Beirut to Jaffa.